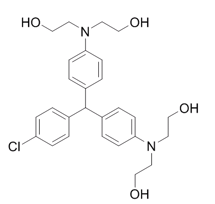 Pexmetinib is a potent Tie-2 and p38 MAPK dual inhibitor, with IC50s of 1 nM, 35 nM and 26 nM for Tie-2, p38α and p38β, respectively, and can be used in the research of acute myeloid leukemia. BRD32048 is an inhibitor of the ETV1 transcription factor oncoprotein. 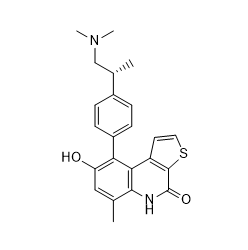 LXH254 is a potent CRAF inhibitor extracted from patent WO2018051306A1, Compound A. LXH254 also is a potent BRAF inhibitor. Sodium taurodeoxycholate is a bile salt formed in the liver by conjugation of deoxycholate with taurine, usually as the sodium salt. It is used as a cholagogue and choleretic, also industrially as a fat emulsifier. Tauroursodeoxycholate Sodium is an ambiphilic bile acid that helps with liver and gallbladder issues. LM22B-10 is an activator of TrkB/TrkC neurotrophin receptor, and can induce TrkB, TrkC, AKT and ERK activation in vitro and in vivo. Carnosol is a potent Ribosomal S6 Kinase (RSK2) inhibitor that could be useful for treating gastric cancer, with an IC50 of ~5.5 μM. 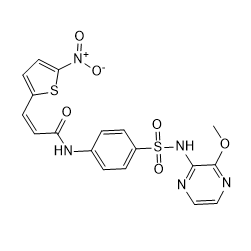 OTS-964 is a potent TOPK inhibitor (IC50=28 nM), which inhibits TOPK kinase activity with high affinity and selectivity. 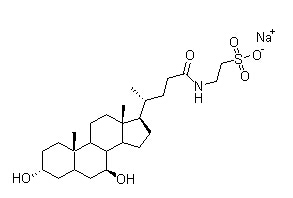 Necrosulfonamide is a necroptosis inhibitor acting by selectively targeting the mixed lineage kinase domain-like protein (MLKL) to block the necrosome formation.